This extreme single wide home remodel is fabulous and extreme is definitely the best word to describe this complete home transformation. 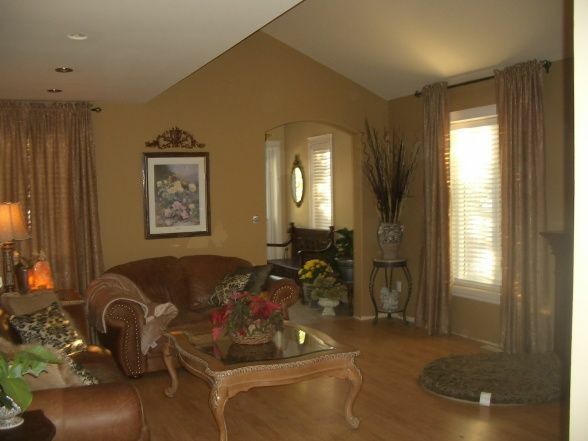 The owners took an older single wide and completely transformed it into a beautiful dream home that is huge! Some people would see a mobile home like that and think it was ready for the junkyard. But where there is a will there is a way. This Single Wide Home Remodel is Beautiful! 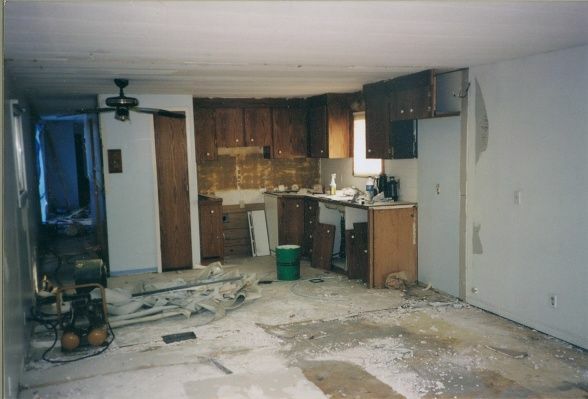 We start in the kitchen after this extreme single wide home remodel. The style looks like a mix of Tuscan and traditional and it is gorgeous! The oak cabinetry, marble countertops, and backsplash adds to the custom design. There are a lot of great ideas in this room. Recessed lights along with pendant lights are always a popular choice for kitchens and for good reason, a well-lighted room is essential for tasty cooking. 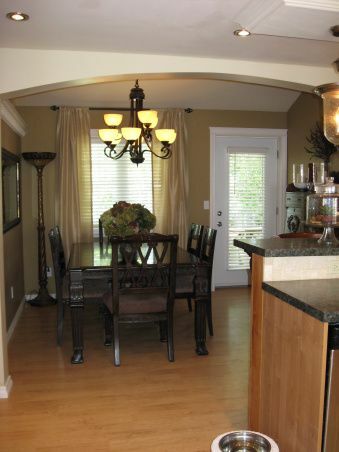 The kitchen is trimmed with wide architectural trim. 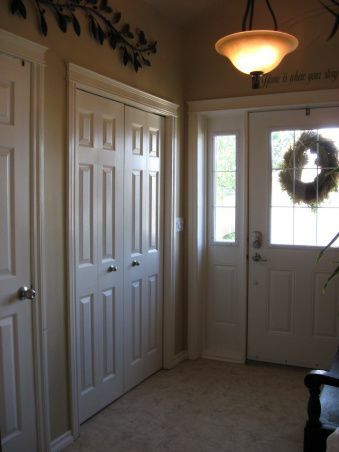 Trim is a great tool to give any room or home a completed look. It doesn’t have to be traditional or decorative, a simple or plain trim can really make the whole room pop. The mid-tone color palette used in the kitchen is very eye-pleasing. Subtle creams and whites let the cabinetry be the prominent feature of the room and not the back splash, flooring or appliances. Surrounding the refrigerator with floor to ceiling cabinetry is a great way to increase storage while creating cohesion. It also makes the refrigerator look like a built-in piece of furniture as opposed to just an appliance. 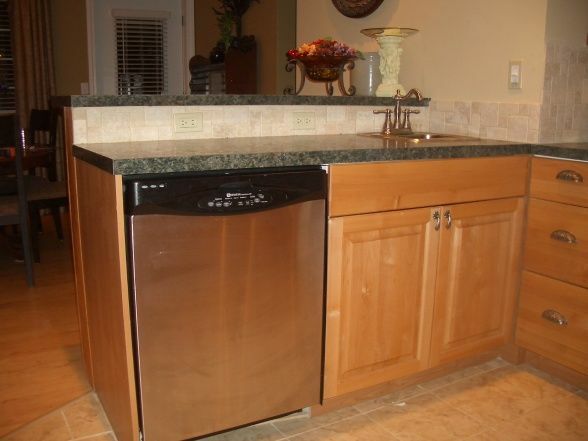 Instead of having the dishwasher close to the sink, where everyone can see it as soon as they walk through the back door and glance toward the kitchen, the owner put hers out of sight. She added a small bar sink close by for convenience. 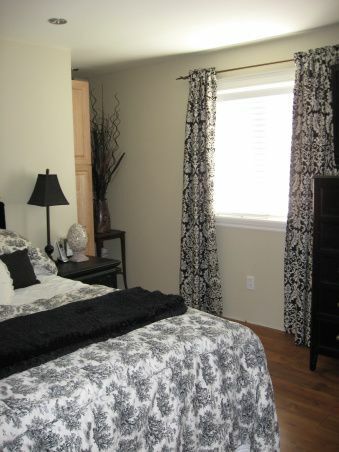 Varying height levels is another great way to add style to a home or room. Sometimes varying heights are necessary for construction, especially when you are building onto an existing home and need to transition to a new room. Use the differences and angles to your advantage. That was just the kitchen, we still have the rest of the home to enjoy! 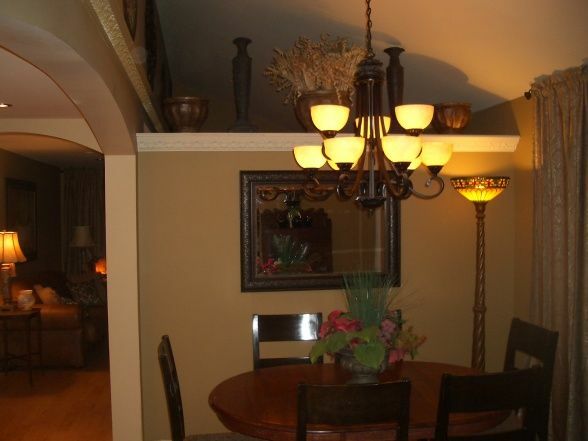 The dining room is right beside the kitchen. The arch is a great feature that frames both rooms beautifully. This room has unique shelving along with the arch. Every inch of space was utilized. I’m guessing the builders needed a way to transition the new build onto the single wide and this was how they got it to play well together. 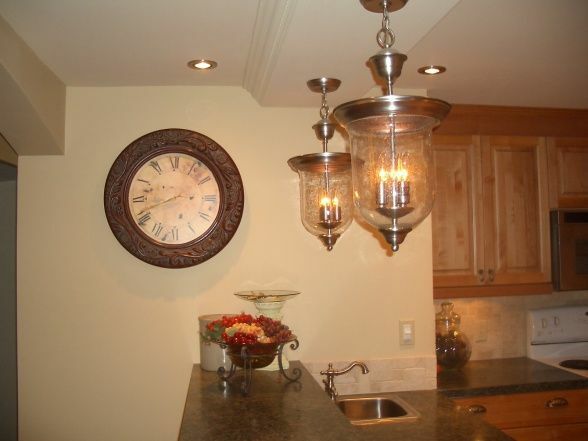 Matching the styles of light fixtures and using warm bulb colors are a great idea to join two areas together. This home is so beautiful! 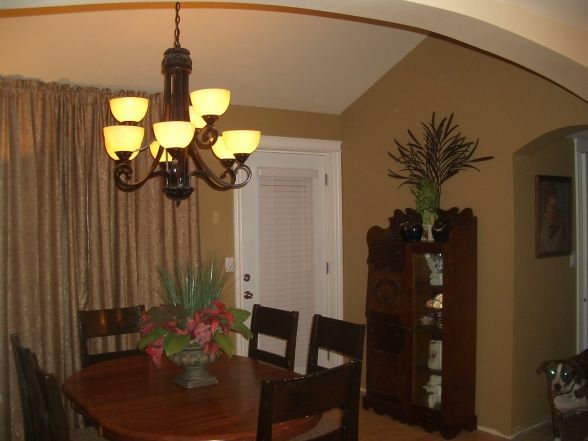 The owners did such a great job with the architectural elements and the decor. 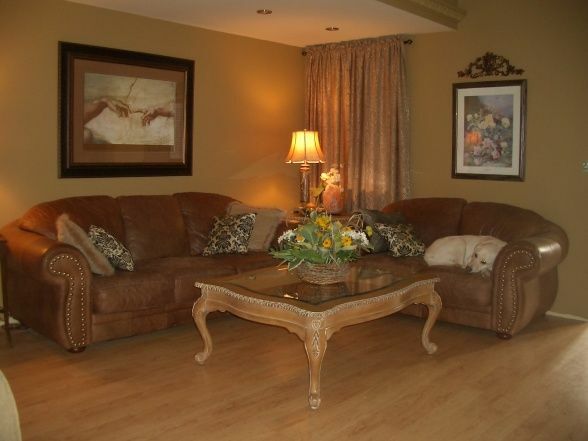 It’s a warm and welcoming space that has great lighting and color. I love everything about it! The traditional decor will always be in style. 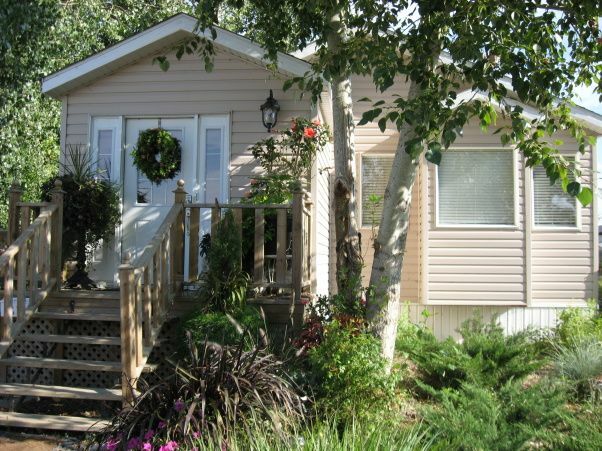 See 25 great manufactured home rooms here. If I’m not mistaken, you can see the ceiling of the original single wide in this photo. The lower ceiling is the original mobile home and the cathedral ceiling is the addition. Using the recessed lighting in the lower section makes it all look as if it were designed this way from the beginning and not just an addition built onto a mobile home. An entryway to store shoes and coats is always a good idea in any home. Seating and storage are essential. Using flooring that is easy to clean and waterproof is another essential feature of a smart entry-way. 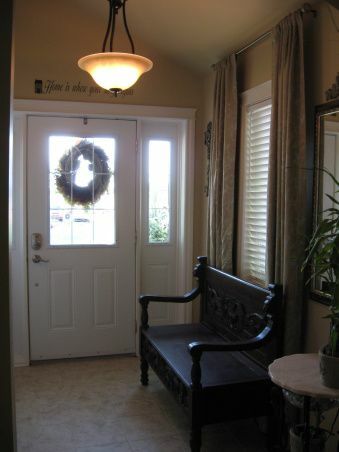 The homeowners have made a beautiful and functional foyer that is stylish and welcoming. 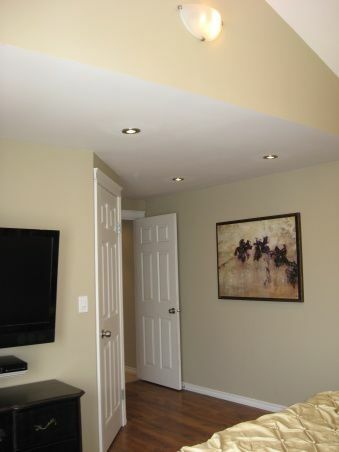 The owner mentions that the lower ceiling, shown here in the master bedroom, is indeed the ceiling from the single wide. 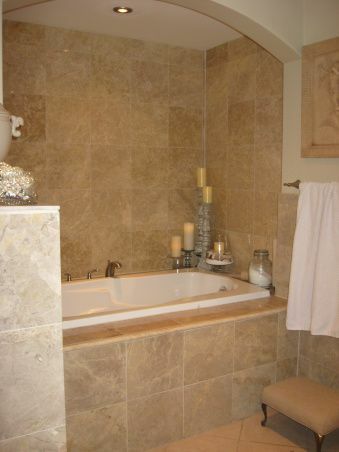 Marble is always a treat in any bathroom! 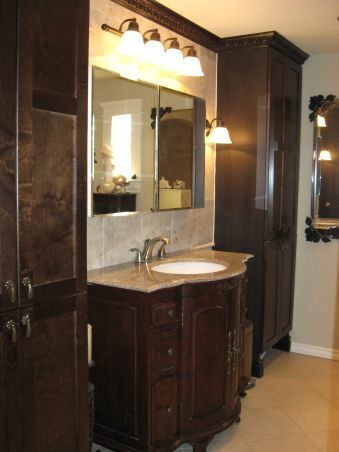 The traditional cabinetry paired with marble makes a remarkable statement. They carried the arch theme from the kitchen over to the master bathroom. This arch frames the tub and makes it a feature of the room. More recessed lighting, too! Wow, what a great master suite! See our mobile home bathrooms guide here. Another beautiful room that’s stylish and welcoming. A built-in shower is one of the most desired features in a bathroom and this one has all the bells and whistles! You should be able to get a clear picture of how the home is built with these photos. I want to assume that we are looking at the original single wide shape in the photo below but I’m not 100% certain. Regardless, it is a gorgeous home both inside and out. 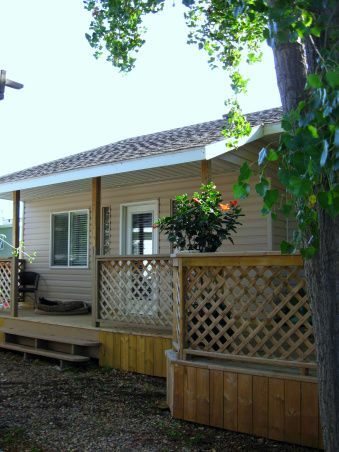 Related: See 45 manufactured home porch designs here. PrairieDog is the username that uploaded these beautiful photos to HGTV’s Rate My Space blog. She stated in one of the descriptions that they were selling and moving. I am actively trying to contact her to see if she will let us interview her and get a bit more information. No luck so far. This single wide home remodel is a perfect example of the potential that all factory-built homes have. You can modify and build on to them all you want! Read more about building mobile home additions here. I appreciate you touring this beautiful home with me and as always, thank you for reading Mobile and Manufactured Home Living! You can add an addition to your home of an size, it just requires its own footers. It wouldn’t be cost effective to just add 2’ down the side of a home, though, instead you could do a 16×20 at the end of your home (or beside your living room, bedroom, kitchen, etc) to get that square footage. Basically, you can turn your home into a 14×80 but you wouldn’t be able to do a 2’ addition completely down the side on your home. So glad you found us! We have over 500 articles so you should find lots of inspiration! If you click on ‘Double Wide’ or ‘Single Wide’ on the black menu bar you’ll get to see all the homes we’ve shared. There’s a category menu, too. There are ideas and projects for every budget. Have fun searching around! If I was just going to update a manufactured home for resale, I would paint the walls white, the ceiling glossy white, add a backsplash and maybe the countertops. I would definitely replace the faucets if they are the plastic ones. Those are all affordable projects but they all have a high return on investment. Click here for few articles that may help you. Best of luck! We recently purchased a brand new Platinum home. 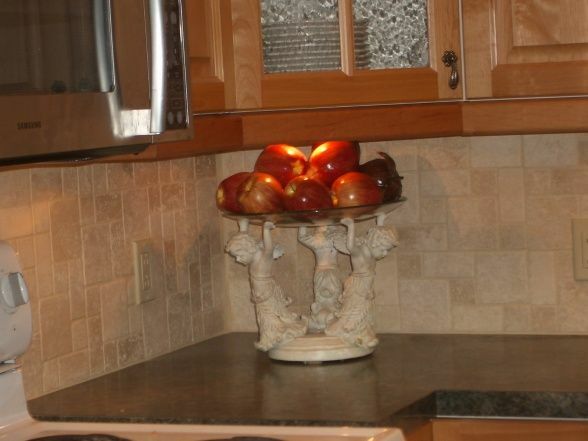 First time mobil home buyer….thought the can lights above the kitchen island were the tratitional can lights used in new construction….Anyway, can the lights they used be changed out to traditional can lights so I can used a screw in pendant light adapter? They put in these led cheapie type lights they call them their type of recessed can lighting, lol! 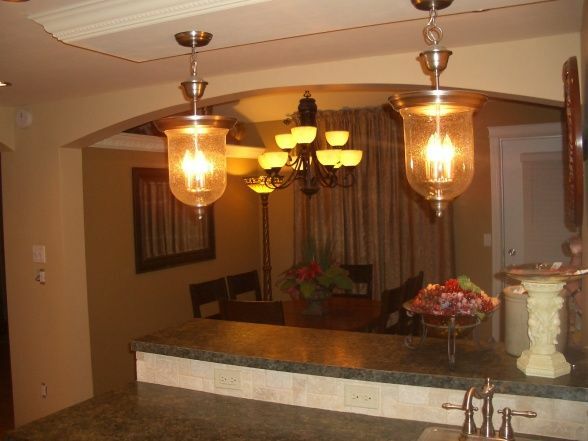 They also “forgot” to put in a main ceiling electrical light outlet so I can hang my kitchen chandelier!! Also, can the home be re-leveled even after it’s been all put together? My husband is concerned that sine it’s all together and the roof in place, it may compromise. Congratulations! You will need to re-level the home every couple of years. Your manual will give you the details but manufactured homes always settle. 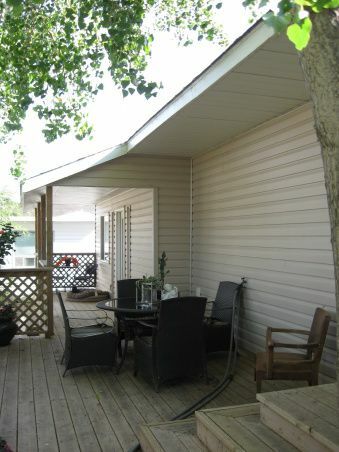 A manufactured home that is not level puts stress on the structure and that’s not a good thing. You can buy your own water level to check the home yourself for less than $50, or just hire a professional. 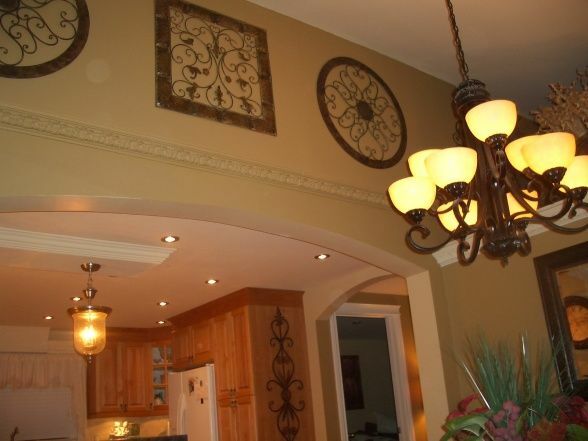 As far as the recessed lights, I’d have to see them to tell you for sure but you can usually replace any fixture. However, I can tell you that LED is definitely the preferred lighting nowadays. It’s cheaper, doesn’t burn as hot, and lasts for years. My father’s 1986 Redman double wide didn’t have light switches for a central ceiling light in the family room or the kitchen. I’m not sure why they do that. Hi im a new single wide owner. Im a experience residential builder but unexperience mobile builder my ? Is my home is 14 x 66 is it possible I can make it 16 x 66 or 18 x 66 make it wider for more room on a single wide instead of purchasing a double wide ? Or add extended floor and anchor bolt to original floor frame and also can reframe exterior wall to add a second story height and rise roof make bedrooms above for more room feeling cramp the way it is now old trailer 3 bedrooms 2 baths, bedrooms like walkin closets. Thank you for any info. Additions can be done but they must be built completely separate from the home and on their own foundations. Each structure must move individually from the other. 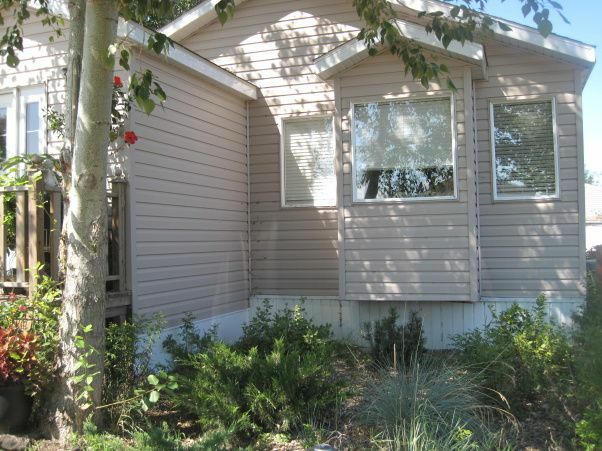 Modifications to the exterior walls of any manufactured home is not recommended at all. It would be an engineering nightmare because manufactured homes derive their structural integrity differently than a site-built home (roof down to the cambered chassis instead of floor up). You could build an addition with a second story beside the home and ‘seal’ the two structures together. Thanks for reading MHL! Best of luck! 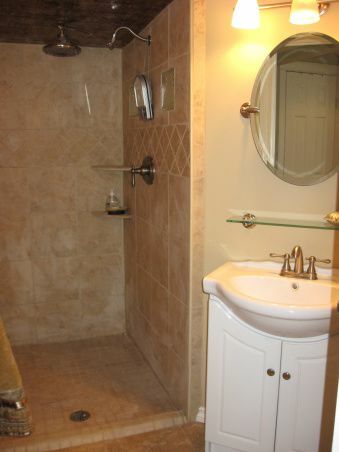 I was wondering if the master bathroom was added on or remodeled? The entire home was essentially ‘swallowed’ by a new home build. The only thing remaining of the original mobile home is the chassis under the floor and a couple of walls as far as I understand. At last i find mobile home life articles and pictures. I just bought a 76′ Redmond and had tons of questions. There’s questions about the sturdiness, safety, and pest that concern me as a new owner of a mobile home. Im afraid of the air vents and something coming out of them. We’re spraying underneath for spiders and anything else around. But im a little naive about getting sick from the spray coming inside. Is any of this possible? Thank you again for giving us new respect among other homeowners. Your vents probably need a little taping around the corners and edges. It requires someone crawling under the home and getting behind the belly wrap (the black plastic) and simply taping up the vents (usually in a straight line right down the middle of the home if its a single wide). Once the vents/ducts are taped you’ll want to go ahead and add some additional insulation under the ducts while you’re already there and then make sure the belly wrap is repaired and has no holes or rips anywhere. Once that’s all done you won’t have anything to worry about, I proimise! The answer depends on the make and model of your home. Some builders build the cabinets themselves and some have a supplier. Home improvement stores get all weird due to possible weight restraints. 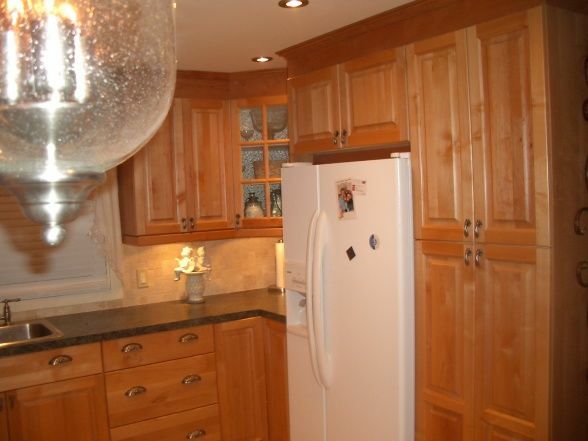 If you are completely remodeling the kitchen you can install any size you want as long as your studs can withstand it. If you do have small studs, you’ll just need to reinforce them with bracing. Any home improvement supplier should be able to find an installer – there’s really no difference between a mobile home and an old traditional home (they both may have smaller studs than 2×4’s). This is for anybody – You won’t have a problem doing whatever you want with a mobile home. I happens that ours was a trashed double wide, but I used the cabinets that came from Home Depot. Just measure the space and add what works for you. Things are pretty much standard, and MH’s aren’t from another planet or anything. They’re just a great blank slate to work with. Tear the walls off if you like. Floors are easy to deal with. They just are really easy to work with. 2″ x 4’s, (maybe a spec smaller than normal, but you can always add more) cheap flooring, probably a particle board that’s easy to replace. Probably some useless “fake walls” that take up space and can be removed in about 30 seconds with a sledge hammer. Perfectly stated Rich! Thank you! Would you be able to provide the layout of the home and the materials that were purchased to remodel? I am in the process of remodeling a very small mobile home almost identical to the “before” pictures. We have gutted out the entire mobile home and now it is bare. My father and husband will actually be the ones remodeling the home but it’s left up to me to design it. I absolutely adore what you have done to this mobile home right up to the ceilings. Please, I would love any information that you can provide. I love this home too! This was basically a whole new home built around the smaller single wide. It cost the owners well over $60,000. 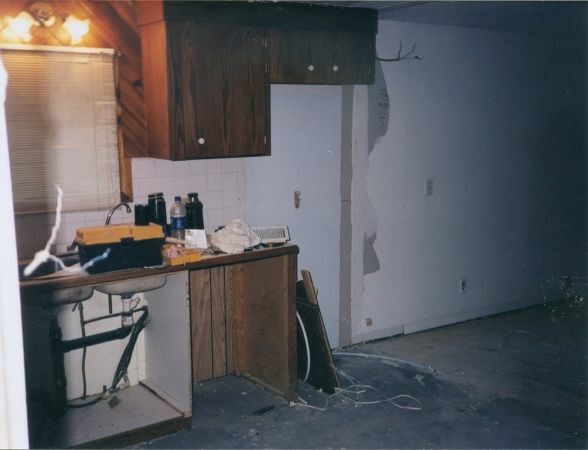 They only left the flooring and ceiling in the kitchen and a couple of walls of the original mobile. It’s an extreme and expensive build but it is beautiful! You could make your home similar without such a drastic cost though you won’t get the ceiling heights unless you build onto the home. Materials are all very high end and custom in the kitchen and likely cost over $15-20k (custom cabinets, marble back splash, high-end counters, etc). If I was going to reproduce the look on a budget I would go with an addition on the front of the home to add ceiling height as soon as you walk in (to give the entire home a more site-built look), and then choose unfinished pine cabinetry that I could stain myself (with no glass inserts – I’d go with a Plexiglas for lighter weight and cheaper price). I’d choose a fake marble material for the back splash and a laminate sheet for the counter tops. Painting all the walls a light tan and adding some crown molding and an affordable laminate flooring would pull it all together. !! But your chooses are put together so marvelously, eye had to pin them. Absltly fantastic. 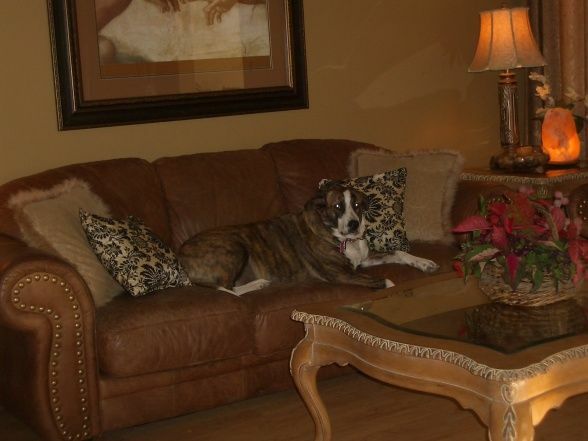 You did a really great job in your house remodeling Los Angeles. Love how it’s done. Perfect. Hello, thanks for your website. Saw the extreme single wide makeover. Nice! My wife and I have a question, please. We live in a 1990 single wide that we’d like to “makeover” and repair but we have been told that even if we put 15,000 into it to make it look really nice, if we ever sell the place, banks still consider it to have “zero” value and won’t loan on it. We paid cash ourselves when we bought the property a few years ago. Is there a way to make a single wide “loanable” so our investment increases the value of the home? It is true that some banks will not loan on manufactured homes but lots of other banks will! Banks and credit unions provide loans on older mobile homes and manufactured homes every day, all over the country. Take California and Florida for example, manufactured homes often sell for upwards of $100,000 and there’s hundreds, if not thousands, of listings on real estate sites for every make and model imaginable, some in parks, some on private land. Those buyers are getting financed somewhere – I’m sure not all of them have cash. Make your home how you want it and while worrying about potential resell issues is a commendable thing to do, I wouldn’t let it keep me up at night. There’s plenty of financing out there! You’re welcome! Sorry I couldn’t be more help. It’s smart of you to do this type of research, you certainly don’t want to put a bunch of money into a home if it can’t produce equity. I don’t remember if you said the home was attached to land but if so, you shouldn’t have too much to worry about. Our ageing society and poor economy (though it keeps improving thankfully!) 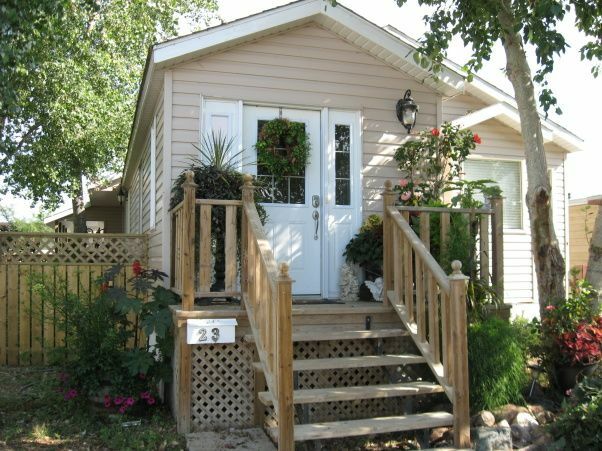 is going to push more people to consider manufactured homes. I guess my 3 best tips to give you about the actual remodeling aspect would be to research similar homes in your neighborhood and keep them in mind so your finished home can compete with them. Refrain from going to fancy or extravagant in both materials and styling. You can do a lot with $15,000 – I recommend new wiring and pipe if needed, then insulation and weatherproofing. Next, would be new doors and windows because they make the biggest impact on both appearance and function in my humble opinion and lastly, updating kitchens and baths. A nice curb appeal can do a lot for a home too! Please keep us updated and take lots of photos for us if you don’t mind – I would love to feature your remodel someday! Thanks so much for reading MHL! What did you do for structural support when you removed the wall in the livingroom for the addition? I’m not the homeowner but I would think they used a standard beam and post That seems to be the most popular way to handle structural modifications. Wonderful home! Curious if you knew of any websites that has floor plans for extending and/or additions to a mobile home? Thanks so much! Unfortunately, I don’t know of any. There’s definitely a shortage of resources for mobile homes. If I find any I’ll be sure to publish them though! How much would a do it yourself remodel like that cost? Hi James! If I had to guess a remodel like this probably cost at least 10 thousand just for the building material. If they hired contractors to do all the work I’d guess the total was well over 25 grand (I’m in WV so I’m used to a lower price per hour for contractors – I’m not for sure what things cost out west). Still, that’s pretty good compared to what a traditional home would cost if you built it from scratch. I am curious, I have a 16 x 80 single wide home. I would love to remodel the kitchen to make it more functional for my needs. Do you come up your own ideas or is there someone who can help with the design? Also, are there contractors who will do the actual work, as my husband and I are totally clueless. I live in western new york and would love to find someone who would help us in renovating. Also has anyone ever added a all season sunroom to their single wide? I think most of us just look for ideas online, in magazines, and at home improvement stores. If you go to Lowe’s or Home Depot, they have software that will help you figure out what design and layout you want and contract with reputable companies to have it at installed for you (at a price of course..lol). You just have to give them your measurements and they order the cabinetry to the exact measurements for you. It’s really hard to try to piece together all the different colors and textures for a kitchen remodel – there’s soooo many choices that most people find it easier to find a complete kitchen they like at the home improvement store and just order it as a complete set. Personally, that’s what I would recommend you do. If you would rather order everything yourself, piece by piece, then you will have to hire someone to install it for you. 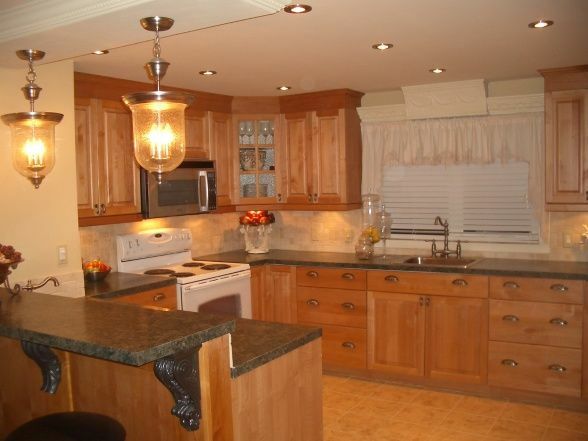 You should be able to find a company that is experienced in manufactured home remodeling in your area – there’s only a slight difference between a site built home and manufactured home (single wides derive their structural integrity or strength from the roof is the main difference) so any licensed contractor should be able to handle kitchen remodels. Maybe you could google search for kitchen remodeler or remodeling contractor online for your area. Please make sure to ask for references (and call them) and get their licensing, insurance, and complaint information – it’s so easy to get ripped off if you don’t investigate the contractors. I don’t want to scare you, just make you aware that a lot of people end up with an unsatisfactory experience and had they called the former clients they could have bypassed it. As for the sunrooms, absolutely! They are VERY popular in the southern states. It’s a great way to add some extra room at an affordable price. There’s some companies online that sell the entire sunroom kits for manufactured homes – one of the most popular mobile home parts companies in the nation, Mobile Home Parts Store, has them here.. There’s all some national sunroom retailers – I see their commercials on TV all the time but I can’t remember their name. Sunrooms, I think. I wish you the best of luck! If there’s anything I can help you with just give me a yell! Thanks! I would love to see a blue print to this home to understand the floor plan better. We are going to add an addition to our single wide mobile and any ideas of floor plans and how it should flow would be great. I’ll see what I can find! Thanks so much! Amazing! Must have been very $$$ to do! You would be hard pressed to believe that this was a mobile home! Great job! This was just done so well! The attention to detail really makes this home gorgeous. Love house tour!! I think you had spent awful amount of time re-designing your place. Kitchen update is quite impressive .I bought a condominium that needed some remodeling. While the bathrooms were usable, they weren’t pretty. 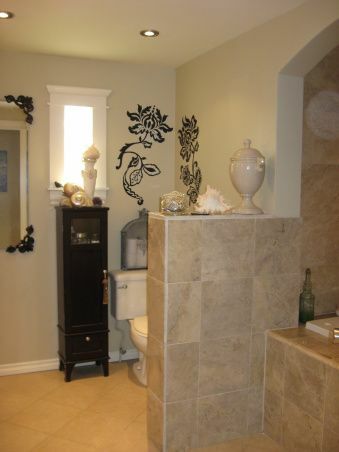 Keeping the bathroom renovation on budget is important for me as I have to do major kitchen renovation too. I love your bathroom and you have utilized every single space pretty well , would love to copy some of your ideas to make rooms more functional and organized. Your kitchen looks fabulous. I liked your cabinet’s colour as I have painted my cabinet with simple white colour but now seeing your kitchen I am very curious to change my kitchen room.